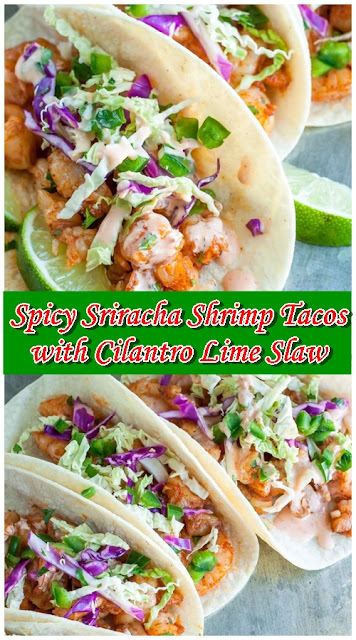 These Spicy Sriracha Shrimp Tacos are fast, flavorful, and topped with a zesty Cilantro Lime Slaw that will rock yours socks! These healthy shrimp tacos are the best! At one magical point in time, I began a love affair with fish tacos. I fell under their spell and haven’t been able to tear myself away ever since. If they’re an option on a menu, you bet your booty I’m ordering them. If the local seafood market has a sale? Fish tacos for everyone!!! I play favorites with my food and regret nothing. Set prepped shrimp in the fridge, covered while you make your slaw and sauce. For the Sriracha Ranch, simply whisk together both ingredients. For a spicier sauce, add extra Sriracha to taste.